This delightful set of science tools will add beauty and value to your science products. Included are 7 images (pictured above) of common items found in a science lab. Each image is a vector illustration, in PNG, 300dpi format. Vector illustrations are superior to other formats because they can be enlarged far more than traditional clip art, which becomes pixelated when enlarged. Vector illustrations don’t become pixelated. This zip file contains PDF & PNG files only. If you are having problems opening this zip file, please take a look at this first (Zip File Help). 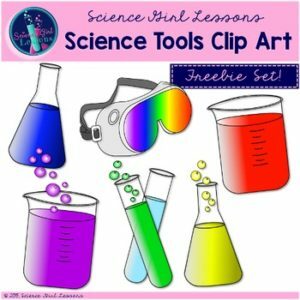 If you are still having problems, don’t hesitate to e-mail me at sciencegirllessons@gmail.com. Khrys Bosland, for the use of her beautiful fonts in this clip art set.